Group room blocks have been made for both on-campus housing and off-campus hotel accommodations. 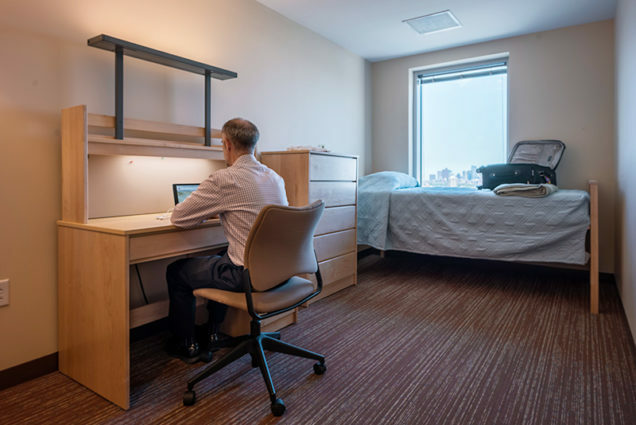 On-campus overnight accommodations for HBES 2019 are being offered at Boston University in the 10 Buick Street residence hall. 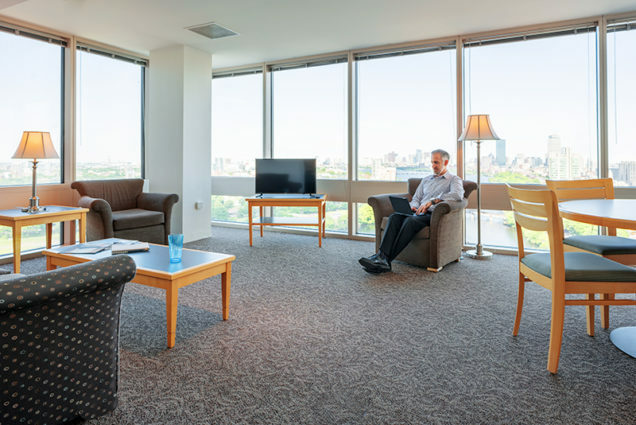 Enjoy picturesque views of the Charles River and Downtown Boston. Opened in Fall 2000, 10 Buick Street is an apartment-style, air-conditioned residence hall. Each suite contains 4 bedrooms, 2 in-suite bathrooms, and a shared kitchen and living area. Bedrooms are furnished with desk, chair, dresser, and closet. Beds are made upon arrival with full linens, blanket, and comforter. Towels, a bar of soap, and shampoo are provided. Living room is furnished with table, chairs, couch, TV, iron and ironing board. Kitchen is furnished with refrigerator, sink, stove, and microwave. Overnight parking can be purchased from 7 am – 11 pm at the Langsam Garage located at Babcock & Gardner Streets. * Student HBES Member rates are available; see below. You must be 22 years of age or older to reserve a room. Students ages 18 – 21 who would like to book a room will need an attending professor to agree to sponsor you while on campus; please indicate the name of that professor in the “Special Requests” field during booking. Anyone that is 17 years of age or younger must be accompanied by their own parent or legal guardian. If you have any questions, please email stay@bu.edu. The on-campus housing cost for a limited number of student HBES members has been subsidized by HBES. Discounted rooms will be available on a first come, first served basis until funds are expended. All student HBES member registrations will be verified after purchase. Please make sure to register using the same email address that is registered as a student with HBES. If the student email address does not match, the conference organizers will contact the purchaser to resolve the discrepancy. If you are not a student member, your reservation for on-campus housing will be canceled and you will need to make a new reservation as a non-student at the full rate of $88 per person, per night.